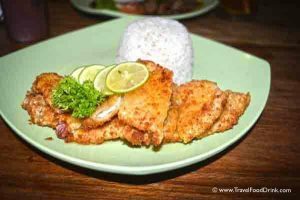 Looking for a Restaurant eatery with fabulous service, good food and great prices in Legian Beach Kuta, Bali? Note: This is an independent hotel / restaurant review based on my personal experience. The Restaurant: A tidy, small and narrow eatery with a fresh modern cafe diner feeling. Colourful pictures displaying some of their offerings decorate the brick look walls. The Service: We were warmly welcomed on our first visit and every visit after by the super friendly server Malik! She was simply great! She had recommendations, was efficient, chatted if you wanted and was always smiling. 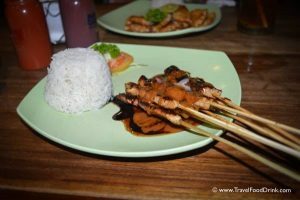 The Food: Nice menu serving traditional Indonesian Food with some Western as well as vegetarian options. Unfortunately, on our first visit, at 1 pm in the afternoon they did not have any cooked rice and said it would take an hour. Assumedly, they had no rice because I have never heard of rice taking an hour to cook. 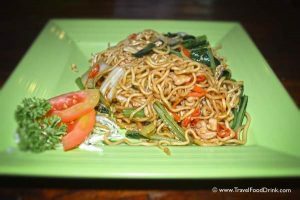 Instead of getting upset, we simply doubled our original order of Mie Goreng Ayam. The fried noodles with chicken was delicious. 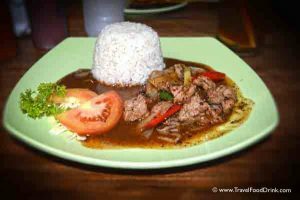 A side dish of Sambal Goreng Pedas added the perfect spice level to our meal. The servings are not huge, but a satisfying amount so you will not walk away stuffed, but not hungry either. The Cost: 92,000 Rupias / €5.50 / US$6.85 including 1 small mineral water, 2 lemon iced teas and 2 Mie Goreng Noodle dishes. 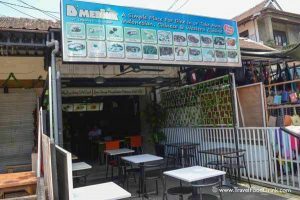 Do I recommend D’Medina Bistro? I definitely recommend it. Excellent prices, tasty food, friendly service. 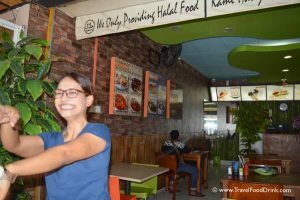 Affordable, cheap food – where to eat in Kuta Legian Bali. 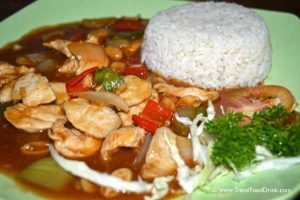 Ayam Kung Pao – Chicken with cashews and white rice, delicious. 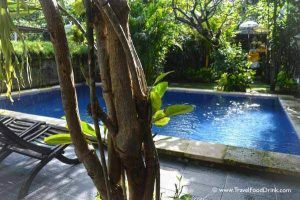 Quiet, affordable accommodation within Walking Distance to Legian Beach, Kuta Clubs and Restaurants. Note: This is an independent hotel review based on my personal experience. The Hotel: We arrived late in the evening, but our wonderful hostess greeted us with a big warm smile and quickly checked us in. We were on the second floor. 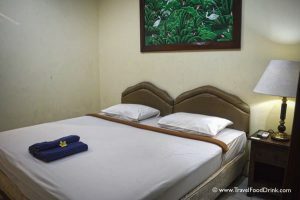 The room itself is simple and outdated, but a comfortable bed, a night table, a lamp and a tv provided the bare necessities. 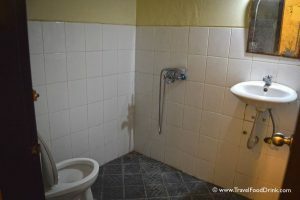 The bathroom was a typical Asian wet room – toilet, sink and shower in one small area. A big bar of soap and towels were provided at no extra charge. The Service: Fantastic! Friendly, helpful and outgoing. The Breakfast: Included in the price, the breakfast was a definite highlight. I had a banana pancake while my husband enjoyed fried eggs. 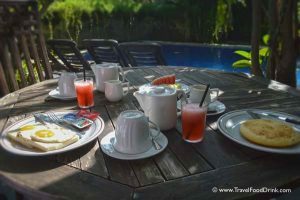 A plate of fresh fruit, butter, marmalade, fresh pressed juice, coffee and tea were presented on a table by the pool. 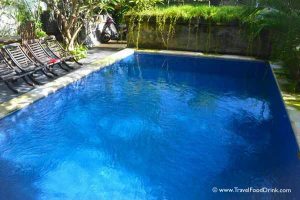 Convenience: Restaurants, clubs, shops and Legian Beach are all within walking distance. 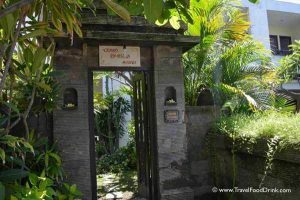 The side street where it is located helps with night life noise levels and while we were there, the guests seemed quiet and respectful. Positive: Almost everything; the host, the breakfast, the location, the pool. Negative: Outdated, run down rooms; Internet is often weak to non-existent so best idea is to buy a SIM card so you don’t have to rely on it. Both afternoons we came back to no electricity, which lasted a few hours due to hedge / tree trimming, I think. Do I recommend it? Yes! 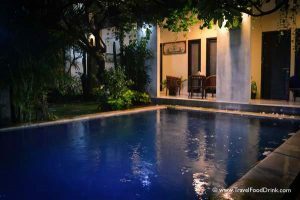 If you are a person who is looking for a quiet place to lay your head at night for a great price, this is what you are looking for.